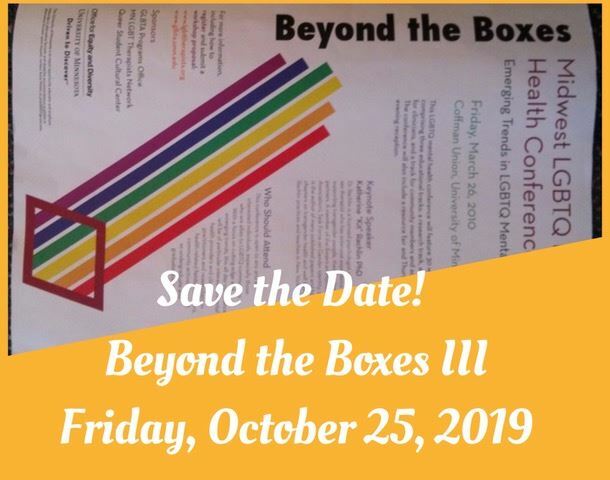 Beyond the Boxes III: MN LQBTQ+ Therapists Network Mental Health Conference: Friday, October 25, 2019!!! Save the Date for this historically sold out conference dedicated to cutting edge LGBTQ+ Mental Health Issues. If you are interested in volunteering on the Conference Planning Conference Committee please email us at network@lgbttherapists.org. Planning meetings will start Fall 2018. Watch this page for more details.